Instantly, the students hushed, all shooting looks of excited anticipation at the cupola door. Aphrodite straightened her chiton. It was cotton-candy pink with a scalloped hem and an off-the-shoulder collar–the latest style, worn especially for this occasion. Fluffing her long golden hair, which she’d threaded with sparkly pink ribbons that matched the color of her chiton, she took a quick glance around the room. She noted with satisfaction the cute shield- and helmet-shaped balloons that floated above the students. Gold and silver streamers had been wound around the tall columns that encircled the inside of the dome. Then the columns had been hung with crisscrossed toy swords and spears. These were all decorations that the guest of honor would appreciate once he arrived. The knob on the cupola door turned. At the very last second, Aphrodite struck a dramatic pose, one hand on her hip. “Surprise!” she yelled when the door opened to admit the muscular, blond-haired godboy of war. It was Ares, her crush. Another godboy, Apollo, who had brought the birthday boy here pretending it was for band practice, now ushered him inside. Ares’s blue eyes widened in delight as he took in the scene before him. “Whoa! This is a surprise!” Catching Aphrodite’s eye, he smiled. “Did you do all this? I can’t believe you managed to keep it a secret from me!” he added when she nodded. “It wasn’t easy,” Aphrodite admitted, smiling up at him. Then she shot a sideways glance at a winged girl with short, spiky orange hair who stood nearby. The girl’s iridescent orange-feathered wings ruffled. “Hey! I can keep a secret when I have to!” she protested. As she spoke, words puffed from her lips in small, white little cloud letters to hover over her head where anyone could read them. She was Pheme, the goddessgirl of gossip and rumor. Several students looked up to read her words and then laughed. Most times, telling Pheme anything was like broadcasting it to the whole world. Especially now that she wrote a gossip column for Teen Scrollazine. However, Aphrodite was sure that Ares’s look of total surprise had been real. Which meant Pheme had managed to keep the news of this surprise party a secret. From him, anyway. No doubt the girl had told everyone else about it! “You did really well,” Aphrodite reassured the girl. “Yeah, good work,” added an apple-cheeked boy with shimmery golden wings. It was Eros, the godboy of love, who was Pheme’s crush. Pheme grinned back at them both, obviously pleased. Aphrodite was about to tell Ares more about how she and her friends had managed to sneak around making all the birthday preparations, but just then Apollo clapped a hand on his back. “Happy thirteen, god-dude,” he told Ares. “Yeah, congrats on officially becoming a teenager like the rest of us,” a turquoise-skinned boy added in a teasing tone. It was Poseidon, god of the sea. 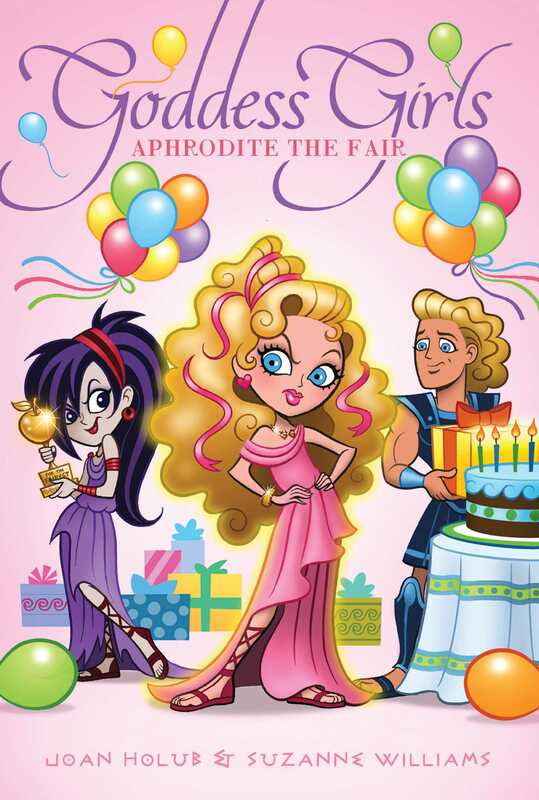 As more of Ares’s godboy friends swarmed around to congratulate him, Aphrodite’s three GGBFFs, Athena, Persephone, and Artemis, came up to her. GGBFF–as in Goddessgirl Best Friends Forever! It was a nickname Athena had come up with recently. It had just slipped out when she’d gotten superexcited about going with her friends to a new fun park that included a snorting beast called a Minotaur at the center of an amazing maze. “Anything we can do to help?” Persephone asked. In her arms she was cradling Adonis, the black-and-white kitten she and Aphrodite shared the care of. As Adonis stretched and began purring, Persephone reached a hand up to adjust the yellow-and-white daisy she’d tucked behind one ear in her curly red hair. The flower had begun to droop a bit, but at her touch it instantly sprang to life, fresh as if newly picked. She was the goddessgirl of spring and growing things and had the greenest thumb of anyone at MOA. “Besides, you guys have already helped out so much,” Aphrodite went on. “I never could’ve gotten everything ready in time without you.” That was an understatement. Plans for the surprise party had been in the works for the last two weeks. Her three friends had written out invitations, set up chairs and tables, put up decorations, and helped with snacks. “Happy to help,” said Athena. The blue-gray-eyed goddessgirl was the brainiest of Aphrodite’s besties. Athena’s dad was Zeus, the principal of the Academy. “And that’s what friends are for,” agreed Artemis. Her glossy black hair was caught up in a cute, simple twist high at the back of her head and encircled by golden bands. Usually a quiver of arrows and an archery bow were slung over her shoulders, but she must have left those in her room for once. Noticing that her three dogs were sniffing around the big round birthday cake at one end of the snacks table, she called to them. “Amby! Suez! Nectar! Get over here, guys. Cake is for guests. You’ll get snacks later.” Wagging their tails, her bloodhound, beagle, and greyhound obediently trotted off to investigate the gifts table instead. “Thanks,” said Aphrodite. She was rather proud of the two-layer cake she had baked and frosted it herself. It was chocolate with blue icing, Ares’s favorite kind. And she’d stuck blue and green candles on top. Thirteen of them, of course. “I actually wanted to make it in the shape of a helmet, but that proved too hard for my limited baking skills,” she admitted with a grin. Just then, a burst of laughter from the group of godboys standing around Ares drew the girls’ attention. “Remember the first time I met you?” Apollo was saying to Ares as the other godboys listened in. “It was first grade,” said Ares, nodding. He looked happy, which made Aphrodite happy. She’d really wanted him to enjoy his party! The other boys laughed knowingly, and Aphrodite couldn’t help smiling. Ares had a reputation as something of a bully, largely deserved. Still, his hot temper had cooled a lot in the past year. Everyone said she had a calming effect on him, so she liked to think she could take a little credit for the positive change. “And the rest, as they say, is history!” Apollo gave him a friendly mock-punch on his shoulder and Ares just laughed. As other boys jumped in to tell more stories about Ares, Aphrodite gazed fondly at him. In her humble opinion, he was handsomest godboy at the whole academy. And though there’d been some rocky moments between them in the past, they’d had smooth sailing for quite a while now. Which boosted her reputation as the goddess of love. Good thing, too. Because mortals and immortals alike might not trust her to help them with their love problems if she couldn’t help herself! “Well, I had a lot of help,” she told him. Feeling pleased at how well everything was going, she gestured toward Athena, Persephone, and Artemis. Her friends had moved over to the snacks table to munch on chips, though Artemis seemed to be feeding her dogs more than she was actually eating herself. “Presents!” Ares exclaimed, rubbing his hands in excited anticipation. The students close enough to hear him laughed. Minutes later, he was seated before the gifts table, his blue eyes gleaming. While the other students watched, he pulled his first gift from the stack–the one Aphrodite had gotten him, as luck would have it. She held her breath a little. Would he like what she’d brought him? Without even looking at the tag that identified who it was from, he quickly ripped off its red-and-pink heart-patterned wrapping. She was pleased to see his face light up as he opened the box. “Awesome!” he exclaimed as he pulled out a brand-new pair of supercool winged sandals. They were the mega-popular “Fly like the Wind” kind from Mighty Fighty, a store beloved by MOA boys. In addition to various athletic sandals (all embossed with the store’s MF logo), the shop carried equipment including bows and arrows, spears, javelins, and shields. “Thanks, Aphrodite!” Ares called out. “Guess he didn’t need to read the tag to guess who that gift was from,” Persephone teased Aphrodite, which made everyone laugh. “Yeah, the red-and-pink-heart goddess-of-love-looking paper was pretty much a dead giveaway,” Artemis added, chuckling. Aphrodite grinned at her friends, then called back to Ares, “You’re welcome!” She was so glad she’d picked just the right gift. Ares tore through the rest of the gifts in no time at all, exclaiming over each new one with genuine delight. Most of the boys had gotten him athletic or battle equipment from Mighty Fighty or scrollbooks about war. Some of the girls had gotten him little papyrus bags of nuts and dried fruits, or baskets of fresh peaches, pears, and pomegranates. Athena had gotten him Homer’s just-published second book, The Odyssey, which was about one of the greatest heroes of the Trojan War. There were gag gifts, too. Like spears that squirted bright-colored washable paint, bobble-headed toy monsters, hair gel to restyle “helmet hair” after an especially long and hard fight, and a tunic printed with: KISS ME, I’M IMMORTAL! “Sure! I didn’t bake it just to sit here and look beautiful.” Aphrodite laughed and waved everyone over to the snacks table. Once the students had gathered around, Apollo’s band, Heavens Above, struck up the Happy Birthday song. Although Ares was a band member, he sat this one out. Literally. He was now sitting before the table in a chair Aphrodite had decorated with streamers. There were balloons tied to the back of it that had BIRTHDAY BOY printed on them. Athena helped her light the cake’s thirteen candles, while Persephone and Artemis stood nearby, waiting to help with serving. Curious about what was going on, Adonis suddenly leaped from Persephone’s arms into Ares’s lap and tried to sniff the cake. Aphrodite gasped. But before she could stop the kitten, Ares settled an arm around it. “Whoa, furball,” Ares said, cradling the kitten in the curve of one muscled arm. “This is my birthday cake!” He smiled up at Aphrodite. “But maybe you can have a teeny bite . . . with some mice cream.” Which cracked everyone up. Still cradling the kitten, Ares took a deep breath and then inched forward in his seat a little. Aw, thought Aphrodite. She sighed happily at the sight of the big, strong guy cuddling the kitten. They looked so cute! She wished she’d thought of having an artist attend the party to draw pictures of scenes like this. Wished? Hey, that reminded her . . .
“Oh, right,” said Ares. His brow furrowed in thought a moment. Then he drew in another big breath, puffed up his cheeks, and blew out all thirteen candles at once. BAM! The door to the cupola flew open so hard that it smashed against the wall! Apollo broke off the rest of what he’d been going to say as all eyes swung to the doorway. Since Hera had stopped Aphrodite in the hall only that morning to say that she and Zeus would try to drop by during the party to wish Ares a happy birthday, Aphrodite half-expected to see them standing there. Zeus was not only MOA’s principal, he was also King of the Gods and Ruler of the Heavens. A powerful guy, he often tore his own office door from its hinges. Not because he was angry, necessarily, but because he didn’t know his own strength. However, it wasn’t Zeus and Hera who stood framed in the doorway. It was a petite, energetic-looking girl wearing a purple chiton. Her straggly, purple-streaked black hair was tied back in a ponytail, and her skin shimmered slightly, the mark of a goddessgirl. She looked about eleven or so, but she definitely wasn’t an MOA student or anyone Aphrodite knew. And she had not been invited to this party; that was for sure. Huh? Aphrodite’s head jerked backward in shock. Ares has a sister?